With the news that Lucien Favre will be the manager of OGC Nice next season, Nice are going to be heading in a different direction for the near future. Nice were one of the pleasant surprises of Ligue 1 this season. A team that wasn’t pegged for anything more than mid-table obscurity ended up finishing 4th in Ligue 1, only two points off of the final CL spot in France while scoring the 3rd most goals (58). They were led by an attacking trio of Hatem Ben Arfa, Valere Germain and Alassane Plea which combined for 37 goals and 16 assists. But things will change for Nice when next season starts. They’ll be losing 81.1% of that production during the summer with Ben Arfa leaving on a free and Germain returning to his parent club Monaco. As with most Ligue 1 teams, finances aren’t abundant, so it’ll be nearly impossible for them to find this production with gaudy transfers. It’s for that reason that they’ll be relying on the likes of Vincent Koziello and Nampalys Mendy, who emerged as building blocks for the future in midfield. Another player that Nice will have to lean on next season is Alassane Plea. Plea is another example of the Thierry Henry effect in France: a winger during his early years who has slowly migrated centrally. Plea hasn’t quite gone as far as the likes of Alexandre Lacazette where he can function alone as a standard CF/ST or even Anthony Martial when he was with Monaco, although perhaps with more seasoning this might eventually happen. Plea is just as tall as Martial while a couple of inches taller than Lacazette while sharing similar attributes in quickness though in terms of raw speed he falls behind the two. On the surface there wasn’t anything outstanding about Alassane Plea’s production. 10 goals contributed on the season (6 goals, 4 assists) is pretty pedestrian. If you prorate it for every 90 minutes, it projects Plea in a better light. A goal contribution rate at 0.64 rated 15th in Ligue 1 this season, a marked increase from last seasons’ production and while the quality of chances he got were nothing special, there was improvement in both that and his finishing. Again, those numbers aren’t mind blowing but it represented continued progress for a 23 year old completing his 2nd season in France. The playmaking numbers were pretty pedestrian though and his rather high assist rate was more a function of Nice’s over-achievement in converting shots into goals than it was anything else. Models project Plea with his current body of work to be a pretty solid player but not quite at the level where he can be considered a “can’t miss” prospect. Improvements in shot volume is a positive, especially considering that Nice weren’t a team that focused on bombarding opponents with shots. Nice only produced ~10 shots per game this season, which was 2nd to last in Ligue 1 behind only Bastia, who only shot 8.7 times per game. Also a positive was despite his increase, it didn’t result in more affinity to long range shooting as the shot charts described which is something you might see with players who increase their shooting load. The majority of Plea’s six goals came from him occupying open space to be a target for a pass, either because he made a decisive run to bend the defense or he just had such wide open space to run into. Only one of the six goals by Plea came from a sequence that featured something resembling multiple dribbles, which was this curling shot versus Guingamp. When it came to shots, the same type of pattern emerged. This doesn’t mean that Plea can’t be a good forward in the near future, there are several top class strikers who do the bulk of their work without the ball. Perhaps one area that Plea will need to work on is incorporating little shimmies and body feints to create a yard of space between himself and the defender without the benefits of running ‘downhill’ against the opponent. One thing that stands with Alassane Plea out is his comfort in playing different areas. He’s just as comfortable playing in a congested area in a half space as he is spreading himself wide and playing as a more traditional winger touching the sidelines. Nice this season played something that resembled a 4-3-1-2/4-3-3. The width provided comes from either the full backs or one of the front three. 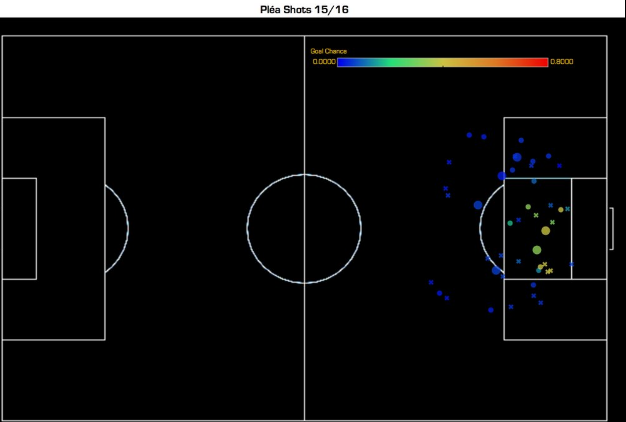 Plea was probably the player most comfortable in a very wide position because it allowed him to gather a head of steam and try to beat opponents in 1v1’s, even though it didn’t end in shot opportunities all the time. At times it got a bit congested in the attacking midfield because Nice love to play intricate passing in short distances. Only PSG played a shorter length of passes in Ligue 1 this season. Often the front three looked like they were only arm’s length apart when the ball was directed out wide. When Plea played in the middle, he played more to break the defensive lines and exploit the space between fullback/CB. In a way, his movements are somewhat similar to Alexandre Lacazette. Both like to find holes within a backline and make runs in between. One difference between the two is Lacazette is considerably more comfortable in tight areas inside the penalty box to shifthis body in a way to avoid defenders, an illustration of the years experience playing centrally. 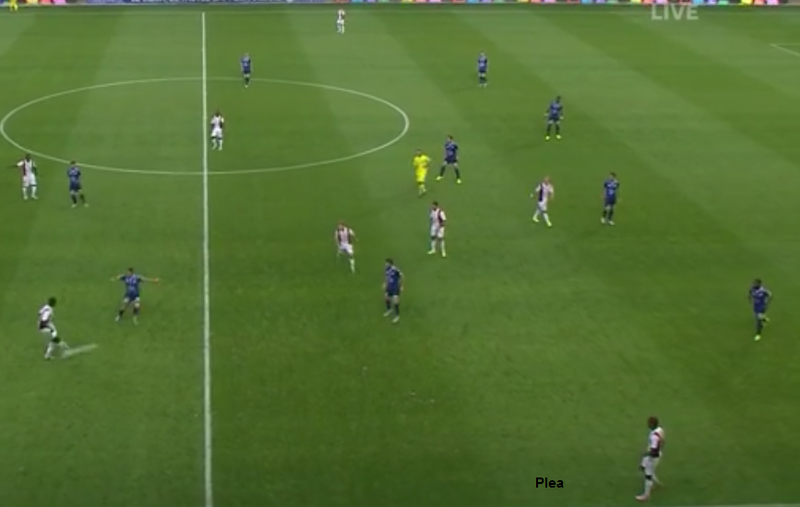 One type of run that both Lacazette and Plea do try and execute is immediately after their team gathers possession and facing a defense regathering themselves, they try and make themselves a target by making a little looping run that ends with them running inbetween the CBs. Plea isn’t quite good enough yet to pull off those type of runs or intricate dribbling moves inside the box but that will come with more familiarity of the position. If someone wanted to make the argument that Plea will eventually become a CF/ST, Lacazette’s evolution could be used as an example. It’s clear that one of the reasons why Plea became an intriguing prospect this season was because he was part of a front three that complemented each other very well. 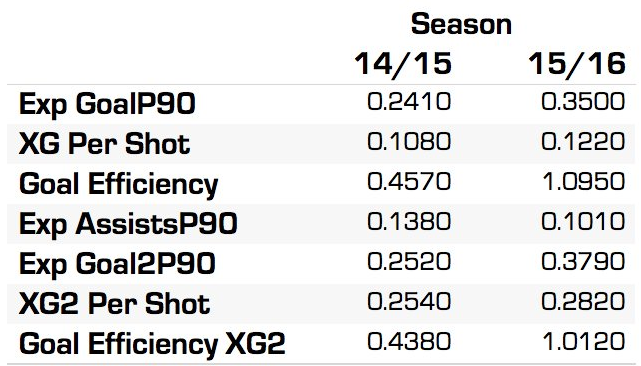 Germain does all the little things you would want from a striker that isn’t tasked with being a heavy shot generator (layoffs, passes from a wide area into an incoming central teammate etc.). Ben Arfa had his career revived this season and it helped Nice in numerous ways. One thing it did was allow Plea to find someone that can attract a considerable amount of gravity with the ball that allowed him to play with more space, especially when said individual can create solo runs like this. Ben Arfa is one of a select few players in the world who can break through an organized defense with his dribbling ability from one end of the pitch to the other, and then go back and do it again. Germain was the perfect 3rd wheel in this trio because his game lends towards efficiency, particularly off the ball. Blink and you’ll see him drag his opposition marker out wide so it allows space for Ben Arfa or Plea to work centrally. While not as quick as Plea, Germain was keen to exploiting space between the fullbacks and he always managed to find himself in a great area to take shots. Germain also ranked 2nd in total aerial duels on Nice despite being less than six foot and he’s adept at doing layoffs for his incoming partners. Of course Germain was quite good with the ball as well and could pick out a runner, particularly on the fast break which played into Plea’s strengths. An assist rate of 0.26 per 90 from a winger is quite good production which might give the impression that Plea is a creative winger. That’s kind of a false impression. For one, despite the high assist rate his overall creative numbers whether it be just raw chances created or expected assists were pedestrian and the high assist rate was mostly a function of Nice having a high conversion rate. Plus Plea didn’t really pass in general, Only Germain had played less passes per 90 minutes and no one had a higher dispossession rate. This isn’t to say that Plea isn’t able to make high level passes or he’s inherently selfish. It’s just that Nice didn’t asking him to do that as his main role and more so tried to accentuate his strengths. Their midfield + Ben Arfa (to a lesser extent) were the ones tasked with the playmaking burden. And there is some evidence to say that he can grow into being a more capable creator with more experience. Even when the passes didn’t come off properly, you can see a level of thinking in the passing attempts. Germain raises his hands wanting the diagonal attempt to hit him in stride, which it didn’t and the possession ultimately went nowhere. Not a lot of wingers are capable of making this pass with consistency, it’s the type of pass that Angel Di Maria has made famous over the years. There was one example that I feel encapsulates Plea’s room for improvement as a passer. 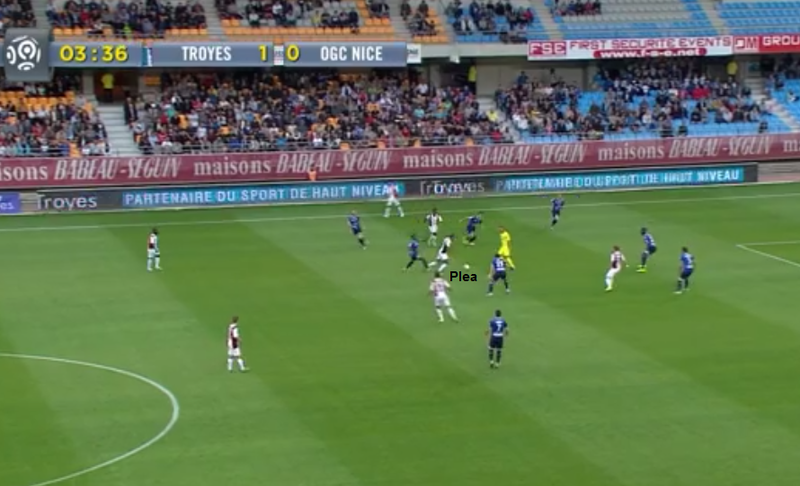 In the same game versus Ajaccio, Plea came back to help his fullback so Nice could retain possession. One he gathered the ball, he made a smooth turn and tried with the outside of his foot to pick out a throughball pass to get Germain on a 1v1 versus the GK. It’ll be interesting to see how Plea performs with his passing next season. While at Borussia M’Gladbach, Favre had the benefits of having a very creative striker in Raffael and perhaps he might think that Plea could become something resembling that. This is one of the ways that Plea can become a very good forward even if he can’t create quality shots individually, by being able to make these passes on a more regular basis which can open more breathing space for himself and his teammates to operate. It would be a considerable stretch to consider Alassane Plea a knockout prospect currently, the type of which a team would be salivating to get and build a whole attack around. He’s not of the caliber of a Michy Batshuayi or Nabil Fekir (when healthy) in Ligue 1 who have major European clubs wanting their signature. While he had a nice enough season, critics could argue that if it wasn’t for the unlikely renaissance of Hatem Ben Arfa, Plea would still be floating around in no man’s land. However glass half full people would point out that at only 23 and just completing his 2nd season in Ligue 1, he’s shown ample progress to suggest that he can more than hold his own in an attacking front three provided it has a focal point. His pace is obvious and he’s increased his shot load while not suffering from shot location issues which is a nice return for his continuation as a more central player. Passing ability is not a strong suit yet but using a “process over results” approach would show that Plea’s ability to connect the pass is lacking but his willingness to try and find a quality passing route isn’t. It’ll be interesting to see how he develops under Favre’s managing. Under his watch, Gladbach played a methodical style based on possession and slowly progressing the ball into dangerous areas which isn’t too dissimilar from what Nice pulled off last season. In Raffael, he had someone who approximated Ben Arfa’s role as dual creator/dribbler. In comparison to say Memphis Depay who went from a shooting happy environment in PSV to a constricting one in Manchester United, there shouldn’t be too big an adjustment next season. Where Plea may suffer is the lack of creativity around him when it comes to the scoring burden. Plea benefitted from the gravity that Ben Arfa attracted with his dribbling and the unselfishness of Germain’s movements. Without them, he may struggle next season as a sort of lone wolf. Nice have an interesting player who’s only 23 and still getting his feet wet in Ligue 1, not exactly known as the easiest league to be for an attacking talent. A product of the famous Lyon youth academy that seem to churn out quality attacking players, his upside may only top out as an above average inside winger but it’s still a level that will command a decent transfer fee, and perhaps this is underselling Plea’s potential because he hasn’t played on a team that has found a good-great balance between shooting efficiency and volume. If the club can continue to find harmonious forwards to play up front with Plea (and of course he avoids the injury bug he suffered this season), then 2016-17 could very well be Alassane Plea’s true breakout season. Welcome to the second 13steps’ Scout Report. Much like the first piece on Christian Benteke, we’re always looking for feedback & constructive criticism. If you have an opinion on the piece, then leave a comment below or let us know on Twitter. The focus for this report is Dutch wonderkid Memphis Depay. Emerging on the scene in 2011, he was immediately a hit. Starting as a tricky dribbler who was a handful to deal with on the counter, he has blossomed into a genuine goalscoring threat. On the left of PSV’s 4-3-3 in 2014-15, Depay was vital in engineering their first league title since 2008.